Shamanism is a way of life that engages our interconnection to the natural world and the spiritual world. While professional shamanic training requires years of study, many core shamanic practices can be used for personal empowerment, guidance and healing. 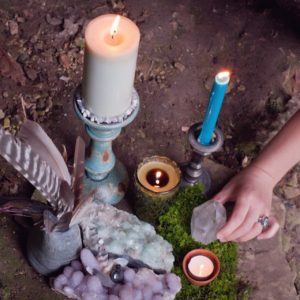 If you wish to deepen your spiritual awareness, strengthen your intuitive gifts, and expand your communications with the spirit world and with animals, plants and minerals, this year-long exploration will give you the tools and the experiences you need for your own personal shamanic practice. Core shamanism is welcoming of all spiritual and religious traditions. In these classes, you will explore your own personal experiences of sacredness and spirituality. There are 12 different courses in this series. You may take each one in sequence if you are interested in receiving a certificate of completion in personal shamanic practice. Or you may take any classes that interest you without committing to the entire curriculum. Experience with shamanic journeying is a prerequisite for most of these courses. For more information on the courses in this series, click here.